Why spend hours stressing over the perfect costume this Halloween? It doesn’t need to be the most intricate or ostentatious one at the party, but it needs to be convincing and exuding confidence while wearing it is a must. A lot of people prefer quick and easy for the tasks set before them in life, so why not have your costume be exactly that this year? Plus, it will look authentic and you'll feel great wearing it. With this Cat Ears and Tail kit, you can transform into a sassy puddy cat as easy as 1, 2, 3! 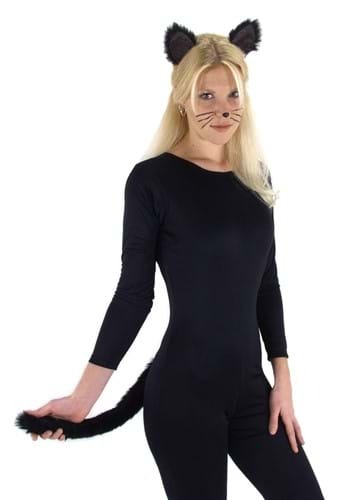 Just toss on a black jumpsuit or some black yoga pants paired with a black long sleeve and then add this costume kit to your attire and TA-DA, you’re the cutest kitty prowling around the party scene. All you need is a pin to attach your tail and if you really want to go the extra mile, you can also grab some of our black face paint and give yourself a cute little nose as well as a few whiskers. Are you meeting up with a kitty crew or are you going as a single kitty? You can invite all your friends to dress up as kitties too or encourage them to pick out a different animal costume so your squad can trample into any party as a pack of party animals.